As proud Americans, it only makes sense for us here at Newmart Builders to produce our steel pole buildings from American steel. We strongly believe in providing jobs and opportunities for our neighbors within our service areas and across this great country. We also feel that only American-made steel can deliver the highest quality and most durable final product that our customers expect. 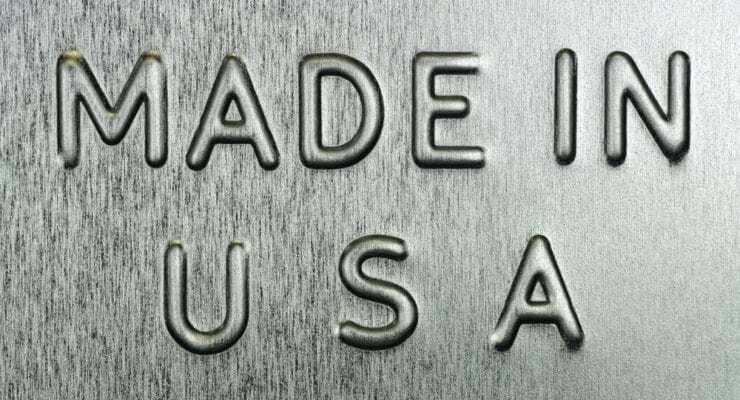 We advertise our “Made in the USA” badge prominently on every single page of our website, but we thought our customers and friends might want to know more about why all of our buildings are only made with American Steel. With the current international trade hostilities driving up prices on many things we rely on every day, we are happy to be able to keep our prices low, since we don’t need steel from overseas. Sourcing our materials from US-based manufacturers saves money on transportation and import fees on a practical level. And on a philosophical level, we just believe the quality of the product is better. The United States has a long heritage of producing steel that has built everything from skyscrapers and bridges to airplanes and cars. The steel produced on American soil today is born from this legacy and pride in creating the best product, which our valued customers deserve. Choose our buildings, and you’ll immediately notice the excellent quality of our 14-gauge galvanized American steel framing and 29-gauge American steel sheeting. We also keep prices low by allowing folks to build their own structures with materials we deliver right to their doors. This keeps costs down for both our customers and us by eliminating the requirement that only professionals construct buildings. Plus, the pride that comes with building something with your own two hands and/or enlisting friends and family to spend quality time together constructing a building is priceless. Here at Newmart Builders, we are interested in keeping jobs and money at home in the United States. We’re an American-owned business, and we seek to give our business to and provide jobs for other Americans. It’s true that much of the steel made in our country is now produced right here in the southern states in smaller mills that utilize recycling to create new material. This means jobs for our closest neighbors to our home in Virginia. This equals prosperity in our hardworking American steel towns today, just as it did decades ago. We care about our neighbors and want to see them succeed – their success is our success, after all. Along with only using American steel, did you know that we also create opportunities for our neighbors in our service area from Pennsylvania to South Carolina through our dealer network? We partner with other dedicated, hardworking Americans who share our commitment to providing our customers with good value and good service at a fair price. With our guidance, these enterprising individuals sell our buildings in their own communities to their friends and neighbors, which makes them our friends and neighbors, too. More generally, we believe that America should still make the things it needs. We all know that manufacturing for thousands of products, from household goods to vehicles to food has moved to distant, foreign countries in the last several decades, and that is unfortunate. More recently, some dedicated companies have discovered that making their products here in the US is actually less costly since shipping and importing has been getting more expensive. We want to support these innovative companies who refuse to promote the wastefulness that comes with importing everything because they believe in the power of American industriousness just as we do. At the end of the day, choosing to support American manufacturing has much to do with integrity and patriotism. Newmart Builders is, above all, a patriotic company. If buying American-made products and supporting your neighbors is a priority for you, we invite you to build your next steel building with us here at Newmart Builders. Durable construction, nearly endless customization options, and configuration to your exact specifications set our structures apart from the competition. But it’s our commitment to American steel that makes us most proud. Get in touch with us today to start the conversation about adding a new American steel structure to your property.